Make sure to "catch" (get it?) John Fea's interview with Rebecca Alpert about her excellent book, Out of Left Field: Jews and Black Baseball. 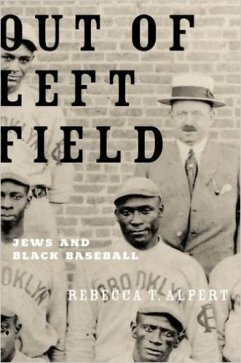 Its paperback release means that it's an ideal addition to your courses on sports, popular culture, and American Judaism. I have had the good fortune of getting to know Rebecca since this book was first published in 2011. I interviewed her for the Religion in American History blog and reviewed the book for Religious Studies Review. I then met her in person at the American Academy of Religion annual meeting. She was involved in launching the "Religion, Sport, and Play" group that I now co-chair. Then, about two years ago, a press approached me and asked if I would edit a two-volume set on religion and sports. I recruited Rebecca to co-edit this with me. We had the idea to assemble something that was off the beaten path, examining the people, places, and sports that haven't gotten sufficient attention in the literature. We submitted our proposal and the press said "no thank you." That hurt--a little (a lot). It seems that they wanted something that was more conventional. We still liked the idea of the volume, though. So after some tweaking, we sent the proposal to Mercer University Press and a contract soon followed. Beyond the postgame pontifications and touchdown prayers, people around the world have found creative ways to inscribe sacred meanings on to the games that they play. This volume will tell these stories, shining a bright light into the dark corners of both institutional religions and athletics. Indeed, religious groups of all shapes and sizes have used sports as a vehicle for inclusion into the mainstream, as a recruitment device, or for developing spiritual and physical fitness. And beyond the “holy trinity” of American sports—baseball, basketball, and football—one finds the traces of transcendence in everything from mixed martial arts to soccer. All told, this collection will reveal the variety of religious experiences within sports on the global stage. We have plenty of rock stars contributing essays, to include Annie Blazer, Joseph Prize, and Michael Zogry just to name a few. Yep, we're excited. It's always interesting to think back on how relationships form and where they go. When I first read Out of Left Field, I would have never guessed that it would lead to this. I'm just happy that it did.